India had a series to forget as they were hammered a 1-4 defeat by England. The Indian batting performance was well below par as except Kohli no Indian batsman was able to score at least 300 runs in the series. 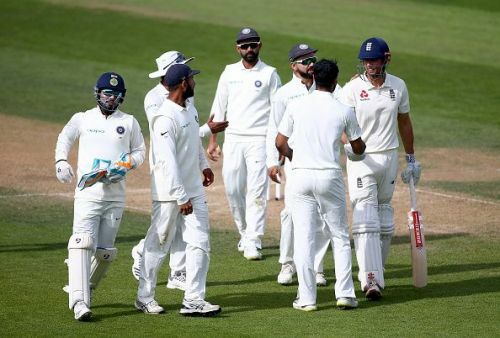 The batsmen played down the long line, were tentative against the English seamers and edged a lot of deliveries outside the off-stump. On the other hand, the Indian seamers bowling performance saved the blushes of the Indian team. 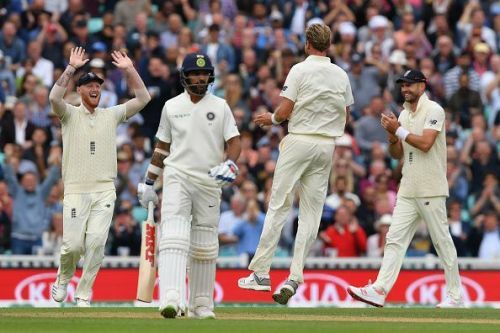 Shami, Ishant, and Bumrah bowled the perfect line and length and hence troubled the English batsmen to a great extent. They almost picked up 20 wickets in every match of the series. Hence, the Indian team especially the batsmen need to go back to the drawing room and introspect about what went wrong for them in this series and come out all the guns blazing in the next Test series. Let us have a look at the rating of the Indian players in this series. Note: Only those players who featured in at least 3 matches have been considered here. Shikhar Dhawan had a very average tour. Despite given umpteen number of opportunities, he has repeatedly failed to cement his position as an opener in difficult conditions outside the subcontinent. In England, despite getting starts, he couldn't convert into a big score to ensure that India could put a good total on board. In 8 innings, Dhawan has managed to score just 162 runs at an average of 20.25. Unfortunately, he has failed to play the prolific swing bowling of Anderson, Broad, and Curran with the right technique and hence has either played down the long line or edged the ball outside the off-stump. 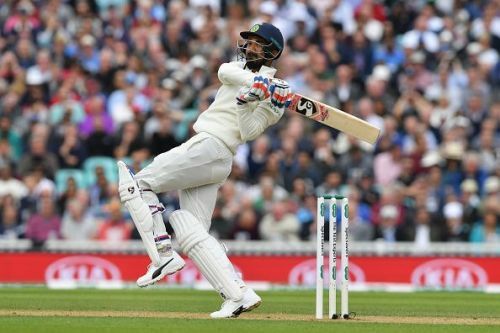 KL Rahul had an average tour and hence has himself raised questions regarding his place in the Indian Test team in the future. Being regarded as a technically solid batsman who has got good footwork, he failed to read the swing and hence was an easy prey for world-class new ball bowlers, Anderson and Broad. In 10 innings, Rahul has managed to score just 299 runs at an average of 29.90. His score of 149 in the 2nd innings of the last Test match was instrumental in keeping India alive in the run chase. Hence, Rahul has to seriously introspect about how he can improve his performances abroad.